During my first placement in a hospice in my third year of training, I helped to care for an older male patient who I will call William. William, who was in his eighties, had been diagnosed with liver cancer which had metastasised. He lived alone and was admitted to the hospice after his condition started to deteriorate. He was not in any pain, so my priority was to make him as comfortable as possible. William’s close friends, who had followed him to the hospice, handed a ‘This is me’ document to the staff. A support tool to enable person-centred care, the document contains information such as what the person likes to be called, any current and past interests, information about routines, and things that may worry or upset them. Accessible to all staff looking after the patient, it is kept with the patient’s notes where it can be updated as necessary so that staff have a better understanding of the person in their care. After reading through William’s completed ‘This is me’ document, I learned about his cultural background, his family, his past professions, and how much he loved the Italian opera singer Luciano Pavarotti. William’s document stated that he is Catholic, but that he had not been to church for some time. Later that day, I sat with him and we spoke about his religion, and he said he would like to speak to a Polish priest. I was aware that William’s condition was deteriorating, and after quickly contacting several churches in the area, I was able to arrange for a Polish priest to see William as soon as possible. The priest visited him at the hospice a short while later, and William seemed calm and content after he left. The next day I spent the morning with William talking about his favourite things – cooking, the Army Cadets and his daughter. When I checked on him an hour later, his breathing had deteriorated. He asked for pain relief and was given morphine. When I checked on him minutes later, it was clear that he was in the last moments of his life. As the nurse rang his next of kin, I sat next to him and played his favourite music – Pavarotti – talking to him and holding his hand until he passed. This experience taught me how valuable the ‘This is me’ document is, and how it can help facilitate high quality, person-centred care at the end of life. It really helped me to get to know William – his likes and dislikes and what is important to him – and assisted William and I in building up our nurse-patient relationship. Getting to know William enabled me to care for him as best I could as he approached the end of life. This experience was a privilege, but it was also emotionally challenging, and I felt I needed to talk to someone about it. As my mentor was not in that day, I talked to one of the doctors who regularly came to the hospice. I had got to know the doctor well, so felt comfortable talking to her. She gave me a hug and we sat and talked through what had just happened. She made me feel supported, telling me that I could talk to her any time, and reassured me that it is normal to feel upset when a patient dies. This highlighted how important it is to debrief after the death of a patient, or after any incident or experience that you feel you need to talk about. Nurses are experts in caring for others, but we have to make sure we take care of ourselves too. 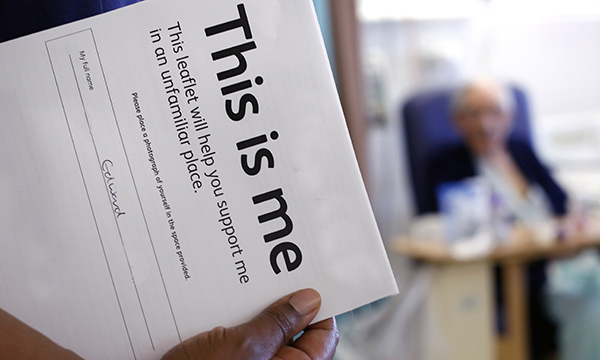 Click here to view a 'This Is Me' leaflet developed by the RCN and Alzheimer's Society.